Sir Nicholas Dominic Cadbury (born 12 May 1940) is a British businessman and member of the Cadbury chocolate manufacturing dynasty. 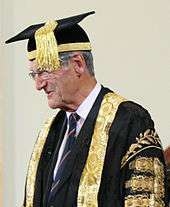 He was the sixth Chancellor of University of Birmingham, stepping down in 2014. Cadbury was born on 12 May 1940, the son of Laurence John Cadbury and Joyce Cadbury, and the grandson of George Cadbury. He was educated at Eton College. After graduating from Trinity College, University of Cambridge, he completed his Master of Business Administration (MBA) at Stanford University. Cadbury joined Cadbury Schweppes in 1964. He was appointed to the Board in 1975, serving as Group Chief Executive from 1983 to 1993, then as Chairman until his planned retirement on his 60th birthday on 12 May 2000. His non-executive positions include Chairman of the Economist Group and Joint Deputy Chairman of EMI. He is also a member of the Council of Management of the National Institute of Economic and Social Research. Since November 2005 he is the chairman of Misys plc. He is married with three children. His brother Sir Adrian Cadbury is also a former Cadbury company executive. Cadbury was knighted in the 1997 Queen's Birthday Honours. ↑ "UNIVERSITY APPOINTS CHANCELLOR". Birmingham101. Retrieved 2010-11-12. ↑ "Queen's Birthday Honours". Times Higher Education. Retrieved 2010-11-12.